Religious Education registration is now open for the 2019/2020 school year. Forms are available in the back of the church and in the Parish office. You can also register and pay on line using the registration link here on the website. 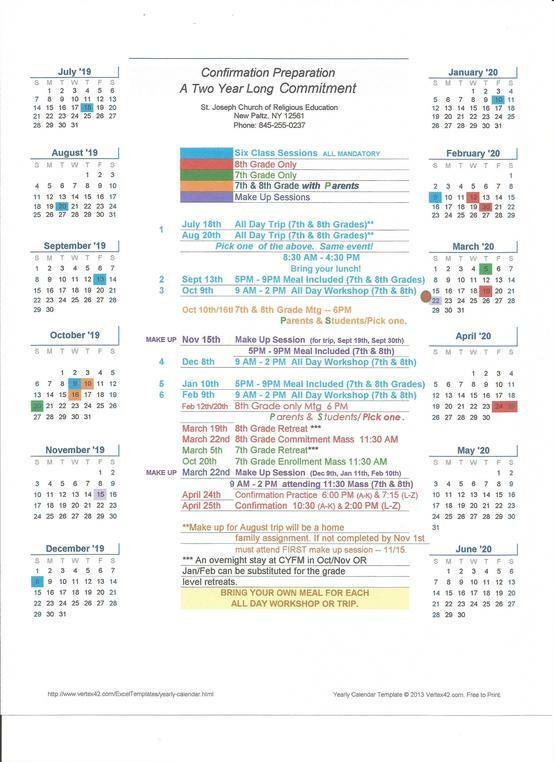 Confirmation Preparation Calendar is posted below. Pre-k - 6th grade classes start beginning the week of September 16. Confirmation Preparation begins with a full day workshop on Wednesday, September 19. RCIA Classes start on Monday, September 24 at 6:30 pm. If you have not registered, please so so as soon as possible as classes are filling up! The registration is on a first come first serve basis. Please choose the best time for your family. There can be deletions from the above schedule if undersubscribed. There will be other options. Please discuss with Sr. Philomena if there is a problem. Please check out our Facebook page and like it!